Spain has been warned that it must follow EU laws when carrying out checks at the Gibraltar border. 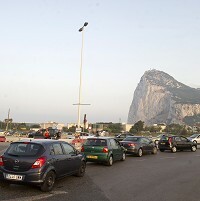 Increased vehicle searches by Spanish border guards caused delays of up to seven hours for tourists visiting the territory last month. Spain says it has a duty to prevent smuggling in the area. The European Commission said that while Spain is obliged to carry out checks, the procedures must "fully respect EU law and remain proportionate". The commission said it had proposed a meeting with the Spanish authorities "in order to address the issues raised by the border checks, including the alleged excessive waiting times". Tensions have escalated over Gibraltar in recent days and while visits are still likely to be trouble-free, tourists planning to visit the area should ensure they have comprehensive travel insurance in case of any problems. Spain has also revealed it is considering imposing a new 50 euro fee on those wishing to cross the border with Gibraltar. Spanish Foreign Minister Jose Manuel Garcia-Margallo told the country's ABC newspaper that Spain was considering charging people to enter and exit Gibraltar through its border post. He also hinted other measures could include the closure of Spanish airspace to flights heading to Gibraltar. Prime Minister David Cameron said he was "seriously concerned", adding that none of the measures had been raised with the UK government. But Gibraltar's Chief Minister Fabian Picardo has accused Spain of "sabre-rattling" over the issue. Spain has long disputed UK sovereignty over Gibraltar, but its latest tough stance is thought to be linked to the creation of an artificial reef in waters off the British territory. Gibraltar has dropped around 70 concrete blocks into the sea to create the reef, which Spanish fisherman say will damage the fishing industry. Authorities in Spain said the blocks had been laid "without the necessary authorisation". They claimed proceeds from the new border fee could be used to help fishermen affected by the "destruction" of fishing grounds.